Dating back to 3000BC, Athens is the birthplace of democracy AND the Olympics. This is your place for food and history. Some of the olive trees planted in the 1200’s are even still producing olives. One of the most popular destinations in the world, Athens greets over 17 million visitors per year. Let’s visit Athens! Visiting Athens? Here’s What To Do. As one of the world’s most historic cities, Athens could keep you busy for days. 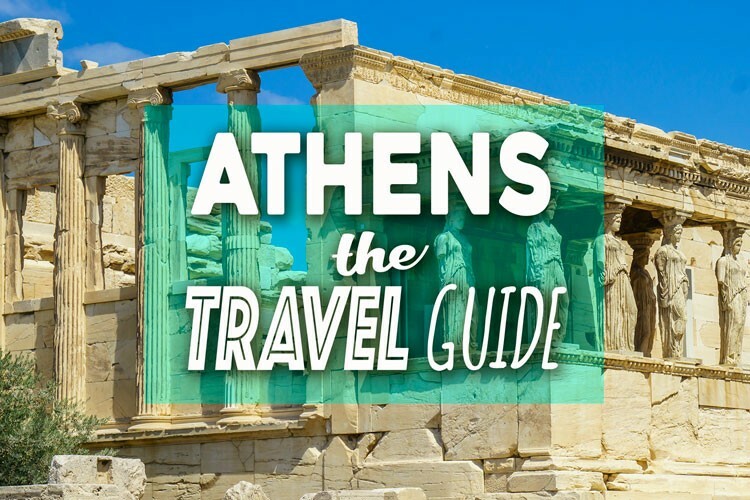 Here’s a list of our must-see’s when visiting Athens. Meaning “Upper City”, Acropolis is perched above, with Athens below. Dating back to the 5th-century BC, this site is home to 21 remarkably well-preserved, and jaw-dropping structures and buildings that shouldn’t be missed. Most notably, Parthenon, Old Temple of Athena, Erechtheum, Propylaea, Temple of Athena Nike, Odeon of Herodes Atticus, and Theatre of Dionysus should be part of any Athens itinerary. Located just down the hill from the Acropolis are the 6th-century Corinthian columns of the temple dedicated to Zeus. Fifteen gigantic columns remain standing, and interestingly enough, one of the original columns was blown over during a 1852 windstorm. This well-preserved ancient Greek temple is located to the north of the Acropolis. This church-turned-museum was built just two years before the Parthenon and is well worth a visit. Built in the 6th-century BC, this is the only stadium in the world constructed entirely of marble. Rich in history, we suggest bucking up for the audio tour and spending some time walking around the home to the world’s first modern Olympics. Offering some of the very best views of Acropolis, this ‘hill’ is located to the southwest of the ancient city. Take the paved path all the way up to see the stunning views. For a shot of adrenaline, visit at night(flashlight recommended). While the Acropolis is literally glowing, the pathway can be very difficult to navigate at night. This famous restaurant serves up some exceptional traditional cuisine. From kebabs and gyros to Greek salad and tzatziki, you can’t go wrong with any dish from this historic restaurant. Visiting an open-air cinema can unique experience in any city, but Cine Paris shows films alongside an uncomparable backdrop. Great films under twinkling stars and the watchful gaze of Acropolis, anyone? We recommend purchasing your tickets in advance as seating is limited and lines can get long just before each show. This local old-fashioned distillery has been serving up more than 36 different flavors of liquors, including their famous ouzos and brandies since 1909. Located in the historic neighborhood of Plaka, this colorful bar should not be missed. Every Friday morning into the afternoon, find this spectacular blocks-long display of local produce in the Koukaki neighborhood. Every Sunday morning at 11am, hundreds gather around Syntagma Square to watch the official ceremony of the changing of the Presidential guard. Arrive early to get a good view and be prepared to move as the police herd the crowd across the street for the parade. Want some authentic Greek leather sandals? Me too! Head to the Stavros Melissinos shop (also known as ‘The Poet Sandal maker of Athens’) in the heart of old town. For a very reasonable 40Euro you too can own a piece of history and walk around in the same shoes as Barbara Streisand, Jackie O, and the Beatles. If planned in advance you can find reasonable direct flights to Athens from most major European airports. Affordable international flights, like Berlin for $21, Milan for $22, Budapest for $37, and London for $36 can be found with our favorite flight search site, Skyscanner. Find the taxi stand just outside the arrival level, next to door 3. The ride takes about 45-minutes and the $40 flat rate increases to $55 between midnight and 5am. The M3 line from the airport costs about $10 and takes 40 minutes. Due to the speed, convenience, and comfort this is our recommended transport into Athens. All bus services depart between exit 4 and 5 on the arrivals level. The $6 ride into the city center costs about 60 minutes. Walkscore.com gives Athens a score of 98, calling it a “Walker’s Paradise”. We also found this to be true and highly recommend walking around Athens. Uber is available in Athens and do recommend it. Although drivers are limited, Uber is cheaper than the local yellow taxi. Public transport in Athens is very user-friendly. With three well-connected Metro lines and an extensive network of buses, trolleys, and trams, getting around the city is easy and quick. For extended stays, look into the 3 or 5 day tickets, available at all public transport ticket kiosks and automatic ticket machines. Athens offers a wide range of hotels to choose from. High-end hotels like MET34 or King George Hotel Athens run about $220 a night, while reasonably priced hotels like Airotel Parthenon or Novotel Athens Hotel go for about $75 a night. When it comes to hotels, we recommend shopping Agoda.com, far and away the most competitive resource when searching for hotels in Athens. With almost 60 hostels available in Athens you will likely find one that suits your needs, but it’s always best to plan in advance. Prices generally range from $10-$20 a night for dorm rooms, while private rooms run about $30-$50 per night. Hostelworld is our recommended resource when searching for hostels in Athens. We love Airbnb, and there are plenty of choices when visiting Athens. From private rooms to entire homes, Airbnb is represented in all neighborhoods of Athens at an average nightly price of only $37. If you’re a first timer to Airbnb use this coupon to enjoy $35 off of your first stay. Choosing a neighborhood is an important part of trip planning that should not be overlooked! Athens is a large city with many districts, each subdivided into unique neighborhoods. While our general recommendation is to stay closer to the city center, here are some of the areas worth considering when deciding where to stay in Athens. Located just south of the Acropolis, this charming residential neighborhood is home to many hip restaurants, outdoor cafes, and the Koukaki Farmer’s Market is held each Friday morning and afternoon. This high-end neighborhood is home to luxury hotels, fancy boutiques, museums and galleries. Located northeast of the Acropolis, Kolonaki is where you’ll go to shop till you drop. This old historic neighborhood, located just below the Acropolis to the east, is full of restaurants, bars, and cafes. Plaka is home to archeological sites, touristy shops, and neoclassical architecture. Located north of the Acropolis, this gentrified neighborhood is where you’ll go for live music and a fun night out. Less touristy than it’s neighbors, Psiri is where the young Athenians play. Tip for good service when visiting Greece. Tip your restaurant server 5% to 10%, round up for taxi drivers, and leave 1 Euro per day at hotels. Greece’s national currency is the Euro, and is currently exchanging at 0.95EUR to $1USD. Credit cards are accepted at most places and ATM machines are readily available. Traveling to Athens is exciting and safe, but you never know when some good travel insurance could come in handy. World Nomads offers the best coverage in the business, is affordable, and is quick to act should something go wrong. For more info, check out our recent World Nomads blog post. If planning to visit Athens, you might want to check out our Athens resource page.